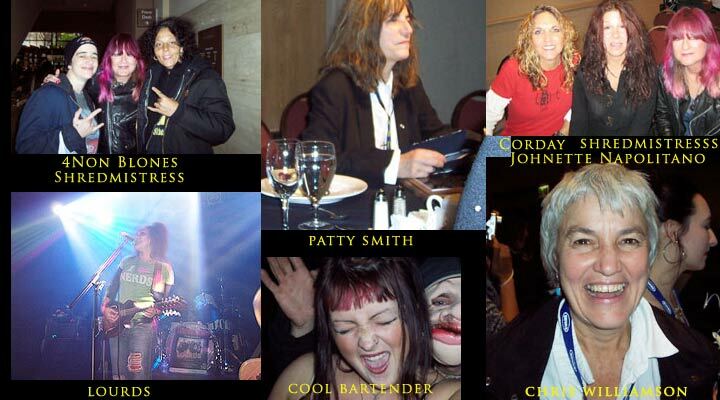 One of the most amazing women music conferences took place in Seattle! Here are some pictures and impressions. Kudos to Carla DeSantis, the founder of Rockrgrl and organizer of this humongous event. the legendary female punk singer was one of the highlights. Appearing with her was longtime guitarist Lenny Kaye. A special dinner was held in her honor in the downstairs ballroom at the Renaissance Hotel, which was packed with her fans. Patti Smith and Lenny Kaye performed a set of acoustic songs filled with Patti’s trademark vocal style. What a treat that was. She also addressed the conference the next morning as the keynote speaker. A rapt audience listened to Patti Smith’s speech, filled with memories from her past, present political statements, and the usual ramblings she’s known for. I walked away with the feeling that here is a true individual who has stuck to her beliefs throughout her career. Truly remarkable. founder, singer, bassist of "Concrete Blonde" was one of the keynote speakers at the conference. I’ve been a fan of Concrete Blonde and her for a long time and it was great to see her in person and hear her speak. She was funny, wise and full of insight and offered advice and support to the many questions that were directed at her from audience members. She kindly posed for the picture above with moi and Jennifer Corday. At one point the discussion turned into a "recording forum" since Johnette is an avid home recordist and has quite the studio. The Shredmistress and her got into it since that’s one of my passions. Too cool for words. above, the legendary feminist folk singer. The Shredmistress met her in the elevator and had the pleasure of chatting with this amazing woman. She posed for this cool head shot. Chris Williamson was the featured guest at one of the many workshops held "Thirty Years of the Changer and the Changed", hosted by author/journalist Ann Powers. was someone I had wanted to see live. She comes from NYC and here was my chance. Playing an awesome set at the cavernous Room 7 club in Seattle, she was brilliant. Heavy rock with finesse, she took no prisoners. Her vocals are stellar and she plays some decent guitar. But her violin solos are what got me. Plus she’s the ultimate performer. Too bad there weren’t that many people there. Considering that there were simultaneous events going on in about a dozen other venues, there were just too many choices. was there in full attendance, playing a showcase as well. Always their "outrageous" selves, they were so much fun and colorful as well. Jennifer Corday and the Shredmistress…. Jennifer invited me at the last minute to sit in with her at the LGBT Center in Seattle and girl… did I bite on that one. I borrowed the Minarik Inferno guitar from the exhibition and went to town with Jennifer on her last two songs. Thanks for asking Jenn and YOU ROCK! played with drummer Stephanie Eulinberg (Kid Rock). I got there too late since the show times had been changed from the official program I had. However… having known Shaunna and Christa for a long time, it was great seeing them again. And also seeing Stephanie who I’d met earlier that day in a workshop I attended. We had a blast hanging out at the bar, drinking a few and bonding. Shaunna Hall has a project called "Electrofunkadelica", resides part time in Spain and is rocking along. Mucho history here. There was so much going on in those three days but I can’t forget seeing Bonnie Raitt and Ann Wilson of Heart together in front of a full house of attentive women, bantering back and forth. They were too cool. Great to see those two super divas lending their services to this convention. There wasn’t a shred of competitive spirit but only the spirit of sharing, hanging out, making friends and networking. That’s the way it should be! I could go on and on about the people I’ve met, re-met, connected with, made friends with (Vickie Blankenship and Cory of Indiegrl… you rule…thanks for letting me share your hotel room)… Minarik Guitars… you guys/girls did yourselves proud.. Nikkie O’Neil who was there with Electro Harmonics, on panels, and in the next booth to the Minarik folks…, Amanda Rootes and Annette Conlon who worked hard during the conference and shared their cabs and were so much fun to hang out with… and last but not least: the fantastic Carla DeSantis who put all this together because SHE HAD A VISION! I think I’ll leave it right here. It was an amazing experience and I will always remember it. We will continually cover notable and important female musicians events, women benefits and concerts.